Home » Archive for category "Mustered Courage"
Below is a short excerpt and a link to the full story. On an unseasonably cool late July evening, Mustered Courage was booked at New York City’s Hill Country Barbecue at the downstairs stage in the Boot Bar. Hill Country Barbecue might sound like a strange place for a concert. It most assuredly is not. The smoked and grilled meat mecca’s stage has a state-of-the-art sound system and has welcomed and seen performances by artists such as Dale Watson, Bob Schneider, and Rosanne Cash. Mixing honky tonk imagery with bluegrass picking, guitar, banjo and/or mandolin strumming, bass plucking, a touch of Aussie humor, charming four-part harmony and top-flight musicianship, Mustered Courage owned the small stage. It has style, stage presence and tons of talent. 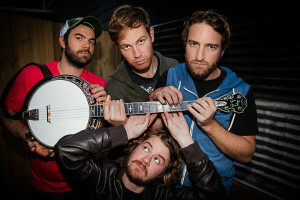 With a mix of dark and bright lyrical forays, layered over banjo-dominated upbeat music, Mustered Courage is a band that screams to be noticed. Though Australia is not generally known for bluegrass music. Mustered Courage may quickly change that perception. Mustered Courage at Hill Country Barbecue—it was finger pickin’ good! Travianna Records is proud to announce the signing of one of Australia’s most unique and sought after Americana bands, Mustered Courage, to the label. Like the Avett Brothers or Steel Drivers, Mustered Courage breathes new life into the bluegrass scene with a style that appeals to both traditionalists and newcomers alike. Travianna Records president, Mark Hodges is incredibly excited to bring Mustered Courage’s music to the U.S. “I first saw them last year in Nashville at the world famous Station Inn when they were here for a short tour and had stopped by to do a showcase at the Americana Music Conference. Blew me away. Total Entertainers. The real deal,” he says.